BTW the default template's Network Type isn't set and Bazarr won't start up. You need to manually set the "Network Type". Mine's at "Host" because I was trying out different things to troubleshoot, since it's working I haven't changed it. This is my docker config, I'm using the development branch. I am getting a path error in bazarr. Movies path works fine, TV does not. Not sure why, this is my setup. I have no path mappings set up in bazarr. I'm not sure why Bazarr thinks your tv shows are stored at /tv/tv shows/. 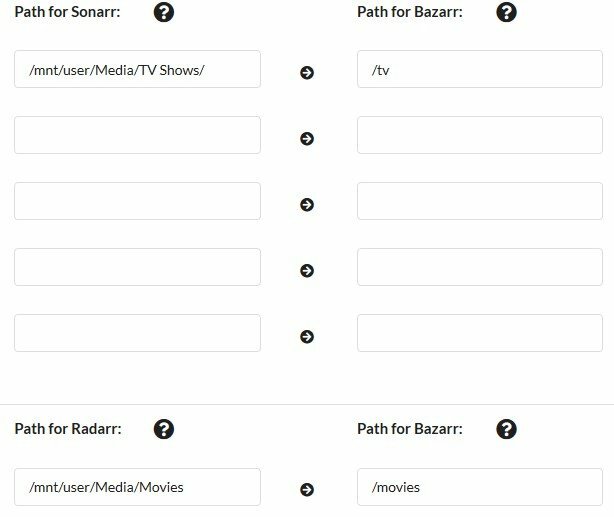 What happens if you tried to add the path mapping for TV within Bazarr? You should get on Bazarr's Discord, that's what I did for help. So I have followed through and set up all the mappings as you said through the initial settings configuation stage. I can actually then get into the Bazarr main page. But at the top it says that Bazarr needs to be restarted to apply the changes made to general settings click here to restart. But when I do that I get it stalled on a page with it just saying Bazarr is restarting Please wait.. Even after waiting for 15-20 minutes nothings changes. If I close that window and try to reload the webui I get the error saying that the site can not be reached. Any ideas, I would really like to set this up, but at a loss at what to try next. This is my Log file after waiting like 15 min on that Bazarr is resetting page. Hopefully this won't confuse somebody more, but, I asked about the setup on the Bazarr Discord and got some info from @morpheus65535 on how to get things mapped/pathed correctly. 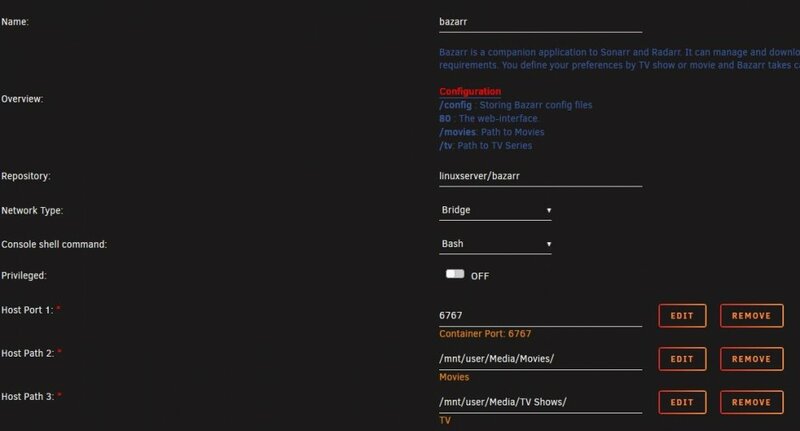 That's fair enough, just a mapping description discrepancy, but here is where the confusion is going to lie for most of us, when you integrate Radarr/Sonarr during the first run of Bazarr, it's going to "import" the mapping of your Radarr/Sonarr containers, in my case, to '/media'. THIS is the mapping you want to change in the Bazarr setup. Point your '/media' to '/tv' and '/movies' (see below) and again, and MIND THE CASES. Just Wanted to give a final FYI how I solved my problem. So that it might help others. So yes do follow the recommendations from above for the Config of the mappings for the file locations. But in the setup on the first page where you are placing the listening port. 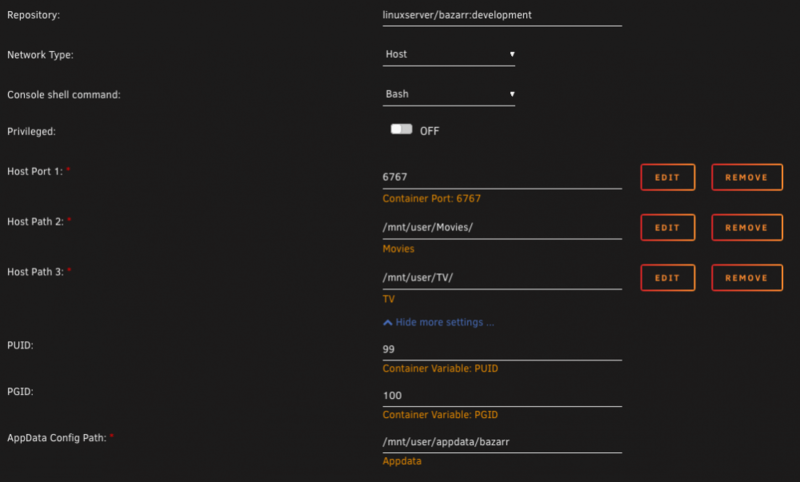 You want to place the external Listening port view able on the Docker Page as 0.0.0.0 (**type this side on the listening port***) TCP --> 0.0.0.0 (internal mapping. I hope this might help others with setup problems. Hey guys. I'm trying to get Bazarr all set up but I'm pretty sure I FUBAR'd something. 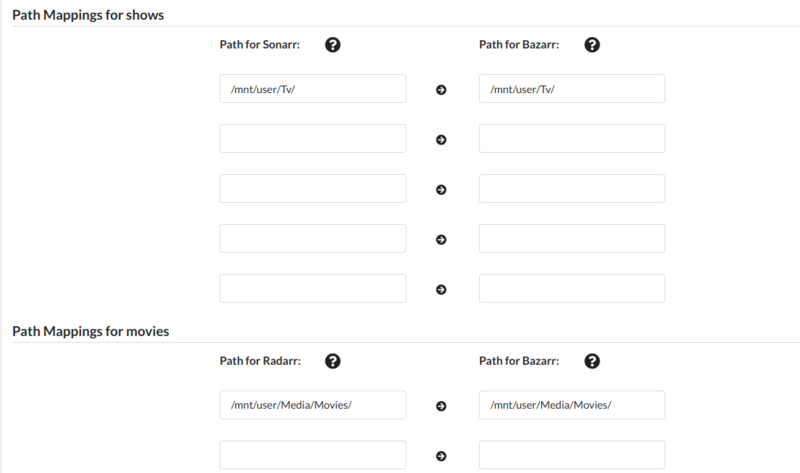 In the Bazarr webui it says that all of my paths are invalid for every file I have. It also will not find any subtitles for any of the content I have. 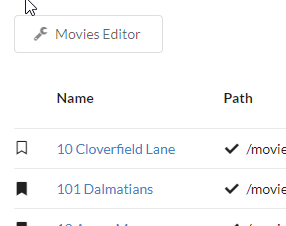 I have made sure to set the Sonarr/Radarr paths and input my opensubtitles account info. You can see what is set up in my below screenshots. 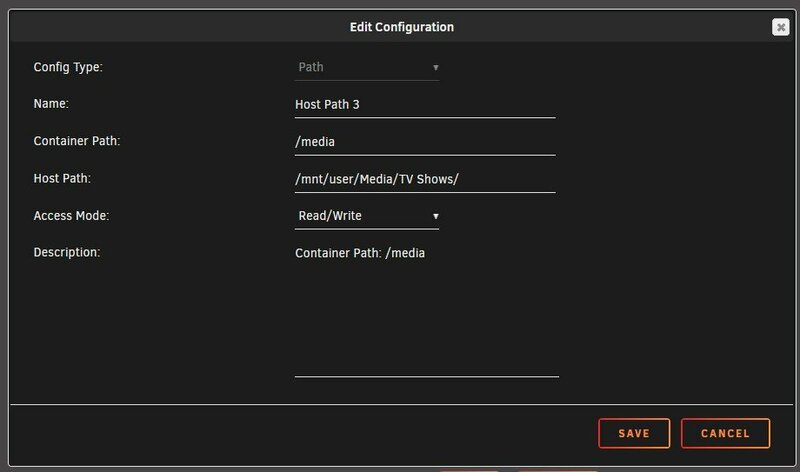 It needs to be the path that the Sonarr container is using container side not host (Unraid) side. 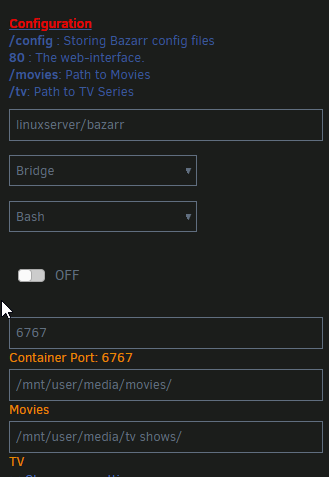 So I should replace it with container path as seen here? EDIT: I changed it and it worked, so it at least sees the files now, but for whatever reason I can't find any subtitles for anything. Is there a way I can fix that too? Trying to get this docker setup and working with sonarr and radarr but having an issue. It scans my library for shows and movies great. But the path in the program is wrong. For example for all movies it’s showing /media/[folder name]. It should be /media/movies/[folder name] and the same for tvshows, it’s showing /media/[folder name] and should be showing /media/TVshows/[folder name]. Any ideas where it gets this path and how to correct the path so that’s it’s correct? Can't find SubDB as provider. It should be there, right? 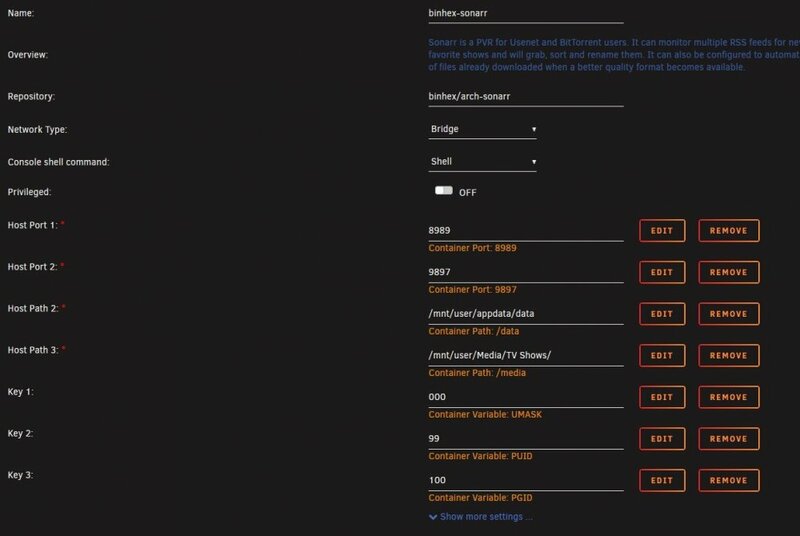 I have a radarr, sonarr, bazarr setup going on and up to yesterday I could not figure out why most of my hard drives in the array would not spin down (or spinning up all the time). 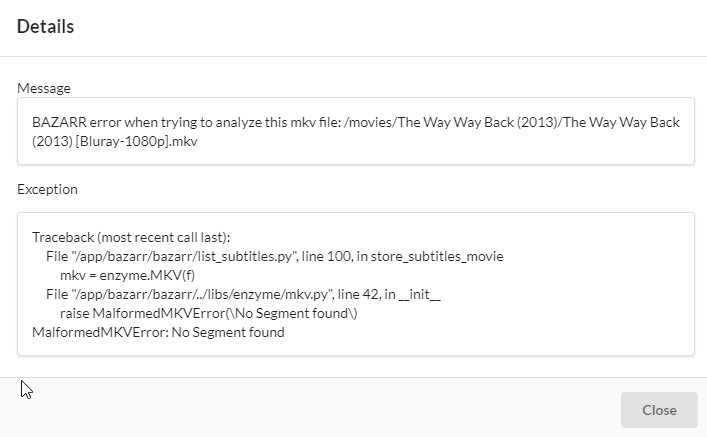 Disabled "ignore subs with wrong fps" in Bazarr because I guessed that it will need to access the actual movie file in order to figure the fps. Disabled "check for embedded subs" for the same reason as above. No matter the settings in Bazarr when search for subtitles is running, media files are accessed and disks spin up. One cannot change the interval of the search and the default is 3 hours. Having both English and a secondary (rare) language as wanted, this means that every 3 hour interval subtitle search will search for subtitles for tons of media and spin up most of my disks. I know Bazarr uses subliminal for the actual subtitle search and download. I shut down Bazarr container last night, spun down all my disks, woke up this morning and all disks are still spun down. 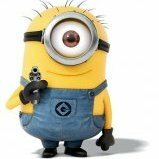 Any feedback to have subtitle search that will not wake up my disks would be greatly appreciated! Not sure what I'm missing. Removed docker and retried again and same thing. Any help would be appreciated. Thanks! I fixed my problem posted above, but now I seem to be having the same problem/confusion that lots of others are in regards to paths for Bazarr and Sonarr/Radarr. No matter what I put in those path, it shows up as /media/ and "This path does not seem to be valid"
It sees all my TV shows and Movies and lists them just fine. But still shows that error.